Grace is a girl without a place in the world. She has spent her life moving throughout the state of California with her mother. A new town every few months. She is a professional "new girl" at school. She finally thinks she and her mother have found their perfect spot, living with Mrs. Greene and Lacey, when the unthinkable happens. Now Grace is living with a grandmother she has never met, in a town she never heard her mother speak of. She begins to meet people who knew her mother and her father, and she learns more about her past in a few weeks than she had known in her entire life. As Grace gets to know the town, she begins to find clues. Clues that remind her of a game, a treasure hunt, her mother used to send her on when they moved to a new place. As Grace tracks the clues, she begins to think that they were left by her mother and that they will tell her what to do. Grace is one of those characters that I just want to pick up and take home with me. She is creative and loving, but she is not going to give herself up too easily. She feels lost and betrayed by some of those closest to her. I also love her new friend Jo and her brother Max. All of the secondary characters in this book are so perfectly written. I feel like there have been a lot of books lately where the girl is dealing with the loss of her mother. Revolution and Sure Signs of Crazy are two I have read recently. All three of these are totally different types of situations, but I feel like Grace, Sunny, and Sarah would be great friends. 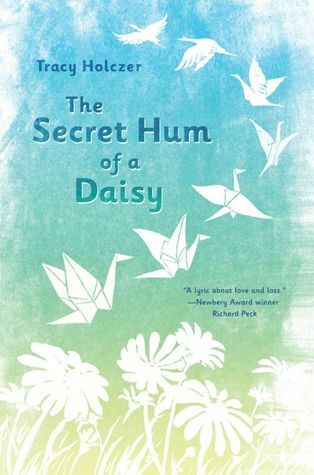 Have you read The Secret Hum of a Daisy by Tracy Holczer? I'd love to hear what you think! I think that middle grade novels need to show somewhat healthier ways to deal with the death of a parent. There have been so many lately where the child takes it really hard and becomes dysfunctional, and I don't think that is a good message, even if it is what happens. But I had the kind of year where I don't want to read about death. I agree with you about the 'Sure Signs of Crazy' thing, Mrs.Williams! I also think that a character like Grace is Tara from 'When the Butterflies Came' by Kimberley Griffiths Little because they both have a fighting kind of spirit. I'm a fifth grade teacher and teacher leader in Ohio who loves to read and share books with kids and adults - or basically anyone who will listen. I have a husband who is obsessed with old cars and two dogs who think they're people. Christina has read 8 books toward her goal of 200 books. Christina has read 1 book toward her goal of 215 books. Christina has read 123 books toward her goal of 200 books.